As I might have mentioned before, my partner is vegetarian and although he’s never tried to convert me, I have happily taken to eating vegetarian only… at home. When I’m out with friends, it’s another story though: bring on the meat I say!! Meat is tastier when you know that the animal was raised in a good environment and had a good life, something that Tim Elwin always had on his mind when he set up his sustainable butchery business, Urban Food Market. 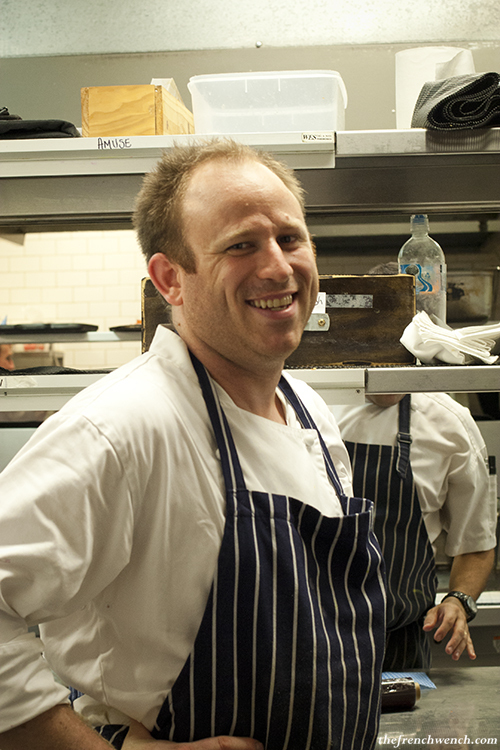 Tim makes a point of only sourcing the best meat possible, raised sustainably and ethically. 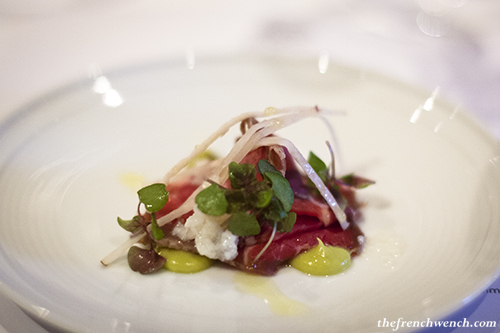 For this dinner, all the meat and wine came from suppliers located within 100 miles of Sydney. The 3 Weeds kitchen also abides by this philosophy, as they try to source their ingredients locally whenever possible. The pub even has a little herb garden, where the chefs can pick what they need and use it straight away in the kitchen. They are also looking at becoming as self-sufficient as possible by using ingredients from their company farm in Terrey Hills. 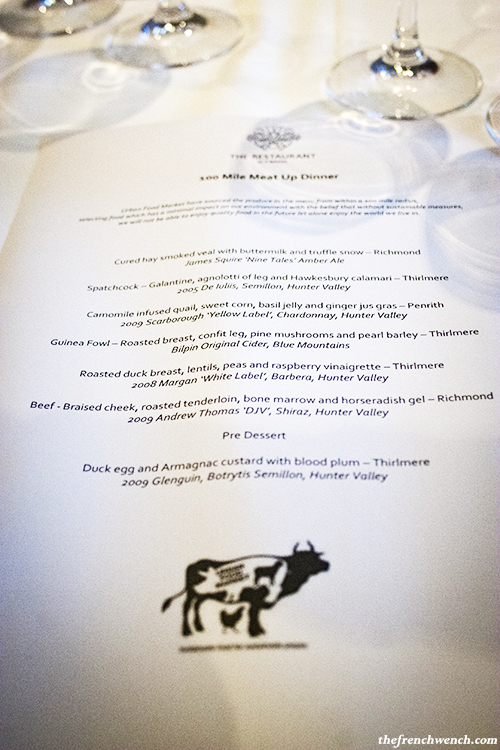 Tim welcomed all the guests and talked about the challenge of sourcing every ingredient for this Meat-Up within 100 miles, especially since his pork supplier bailed on him at the last minute (to the great despair of Karen who is a pork tragic!). Shortly after we were brought a freshly baked sourdough bread roll with some hay-smoked butter. 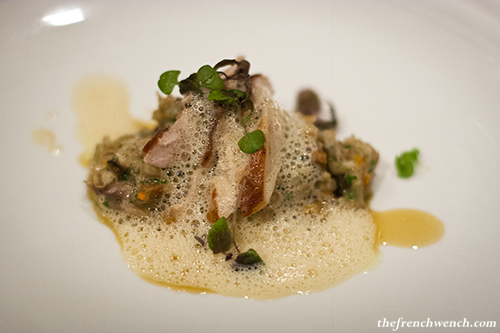 The Quail dish was the winner to me though, and most of the guests at our table seemed to agree! 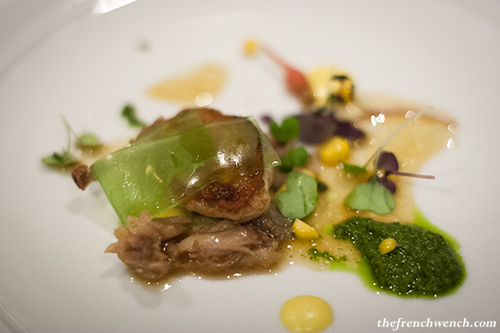 The quail was perfect, tender with crispy skin, and I especially liked the basil sauce, which had a refreshing hint of citrus. 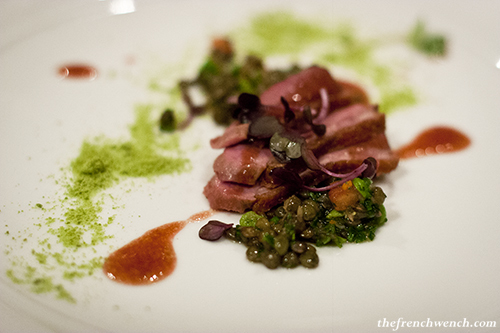 This was one of my favourites as well, I just love duck and the raspberry vinaigrette was a great match. 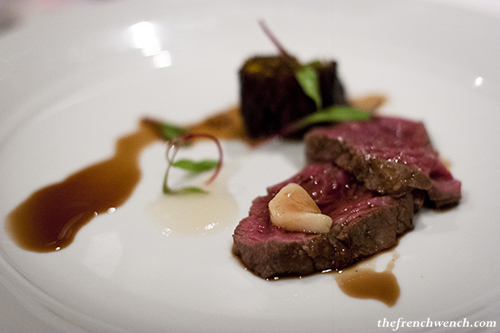 The beef pieces were both very good, the beef cheek slow-cooked and the tenderloin rare and tender. I was expecting the horseradish gel to be stronger though. Everyone at the table marvelled at the bone marrow, but I have to admit it doesn’t have the same effect on me… don’t know why! Then it was time for the sweeter things. After a lovely raspberry panacotta pre-dessert, we were brought one of the highlight of the evening. 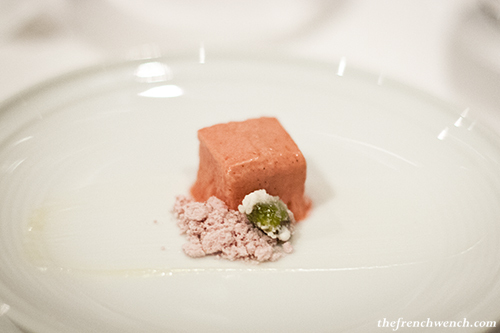 This dessert was just delicious and beautifully presented. 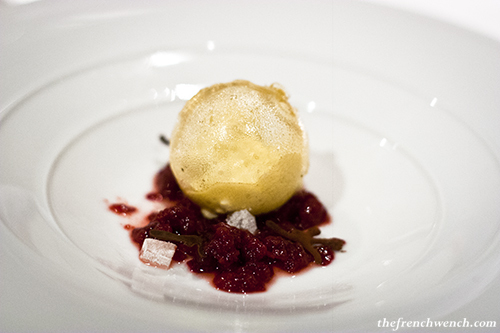 We cracked the sugar shell to access the duck egg and Armagnac custard, which went beautifully with the blood plum puree/compote. The matching wines all came from the Hunter Valley (beer and cider were local as well). My favourite: 2008 Margan “White Label” Barbera, that we had with the Duck, love red Italian varietals! Thank you Tim and Leigh for a great dinner and for boosting my protein intake tenfold in the one night! The next Meat-Up will take place at the Urban Food Market warehouse itself, check out their website soon for more info! This entry was posted in Events, Restaurants and tagged 100 Mile Meat Up, 3 Weeds, Leigh McDivitt, Tim Elwin, Urban Food Market. Bookmark the permalink. You lucky duck, Sandra! It all looks absolutely stupendous. 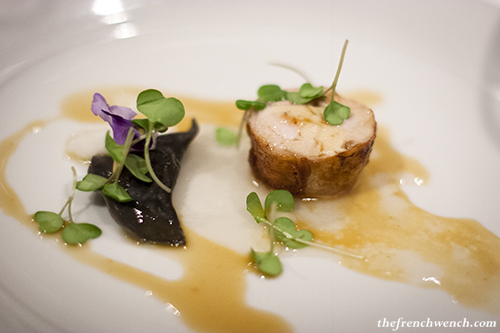 The only one I feel a bit squeamish about is the guinea fowl. I am not a fan of anything frothy like that. I have seen too many babies dribbling in my time:-) I would have scraped the froth to one side and tried to think of something else. Très belle présentation de tous les différents plats, je suppose que tout était très bon aussi ! T’es à la diète aujourd’hui ? Great post & lovely photos. I love what Urban Food Market stand for – hopefully I’ll make it to one of their meat ups soon. OK, it was all about the meat and it was great. 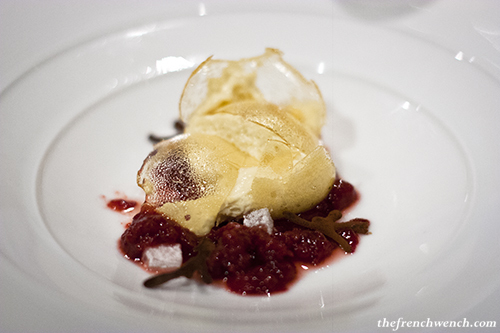 Yet can’t help but wonder why am I still dreaming of Duck egg and Armagnac custard with blood plum? I know why, because it was THAT GOOD! I’m a big fan of the 3 Weeds and sorry that i missed this outing. Sounds like it was lovely night and you have the photographs to prove it. Thanks for sharing.